You’ve no idea how excited I was to come across these! Not only are they fine examples of that playfully inventive era of typography, but the irregular shapes are so typical of the ‘contemporary’ style - epitomising all the post-war optimism of a bright new future in modern technology, materials and design. The pink and blue one in the front has an incised credit on the back: A POLARISED DISPLAY BY RETIGRAPH LIMITED LONDON S.E.15. And it lives up to that intriguing credit. Those vertical black lines shimmer as you turn it left and right, to mesmerising effect. 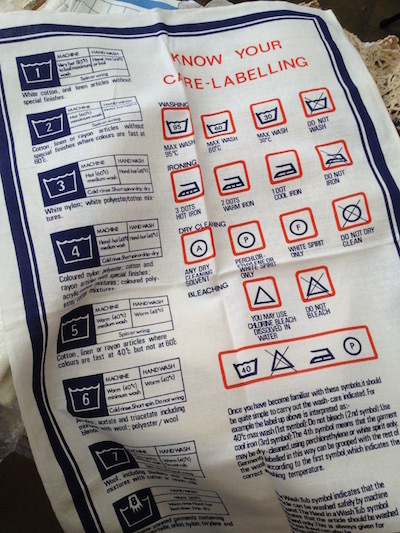 I find some tea towels irresistible, and this one is not only a useful reference - it is destined to be hung above my washing machine - but it features those neat little graphic icons we have all grown so familiar with, to the point where we no longer appreciate their economy of design. Clothing care symbols were made compulsory in the UK in 1974, so this is likely to date from that year. An amusing negotiation was involved in the purchase of this tea towel (well, you can be the judge of that). 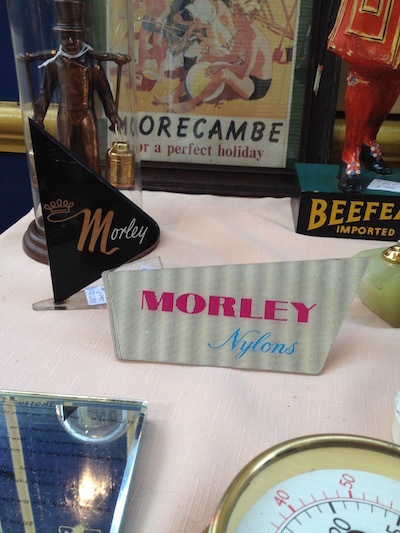 On enquiring about the price, I was told by Victor that linen tea towels were £3.00 and cotton tea towels were £2.00. We checked the label - it was 50% linen, 50% cotton. Oh, how we laughed! As winter appears to have finally arrived, it was by fortuitous chance that my hand fell on this delightfully eccentric cardigan, featuring bands of horses, devilish looking women and an exuberant burst of citrus colours in abstract patterns. 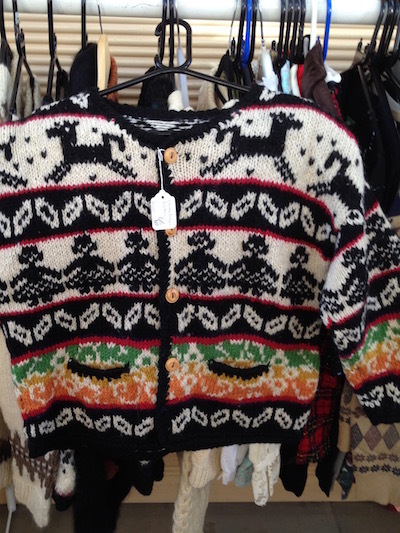 This sturdy garment would fend off the worst of the winter chill and, although it is not quite my style, I couldn’t fail to be charmed by its wonky, folk-art appeal. At its original price of £20.00 it was a bargain already, but at half price it was a steal. I didn’t last long in the Brownies. I gave it a go, but all that swearing allegiance to God and the Queen didn’t sit well with me. What a bolshy little brat I was! 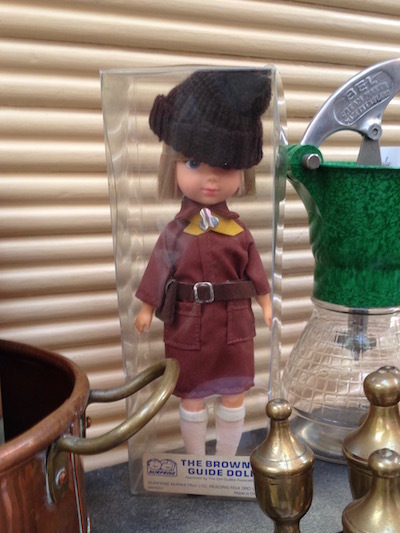 However, that doesn’t mean I’m immune to the charms of this little doll, with her ribbed knit beanie, top-stitched dress, white knee socks and belt with attached pouch. 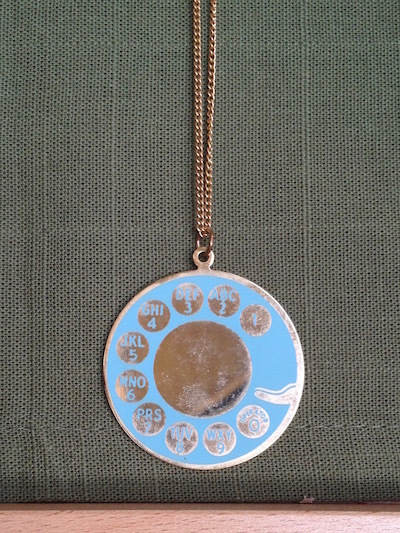 A pristine example - ‘Approved by the Girl Guides Association’ - in her original box. This tiny recruit to the Brownie army is much more neatly turned out than I ever was (and I'm very envious of her razor-sharp bob). 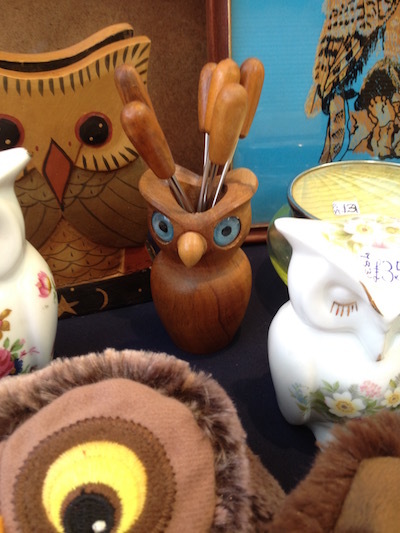 Maureen had a cluster of owls on her stall - apparently, the collective noun for owls is a ‘parliament’, isn’t that great? - but I went straight for this little wooden chap. Firstly, because I collect 1960s-70s wooden trinkets, and secondly because I have one of these already and had no idea what it was for as it was empty. A mystery solved, and another happy addition to my wooden menagerie. Novelty costume jewellery depicting unlikely subjects is a weakness of mine, and this necklace was very tempting. My terrible photo doesn’t do it justice - it was in excellent condition and just needed a light buffing to polish off those browsers' fingerprints. Lucky Lucie of Shady Lane Vintage is a regular visitor to the US, and has an incredible selection of American vintage costume jewellery gathered on her travels. Trust me to pick possibly the least glamorous example from her dazzling display! Oh dear, guess who forgot to line up a Finder of the Fair again! In my defence, we didn't have much time after Christmas and the New Year to pull the January fair together, so I'm afraid you're stuck with me (Sarah). 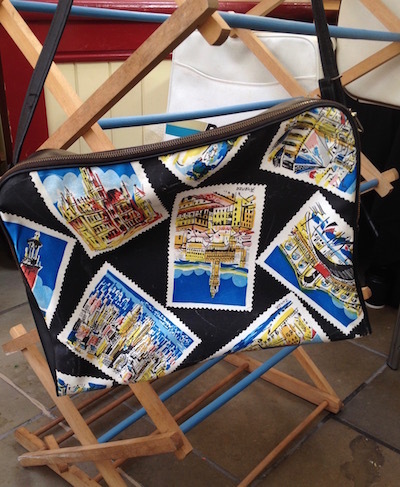 I'm one half of the two-person team that runs The Vintage Village, and I'm also TinTrunk, vendor of 20th century luggage and costume jewellery at 20th Century Stores in Stockport's Market Place. The highlight of every month is the fair - contrary to what you might think, the hard work is over by fair day so I can relax a bit, after a month spent frantically getting everything sorted. I always look forward to having a quick mooch around, catching up with all the lovely traders and regular visitors I've been lucky enough to get to know, and browsing all the amazing goodies on offer. This is only a tiny selection. I could have picked a lot more! I’ve always had a troubled relationship with the word ‘retro’. It has become the generally accepted term for 1960s-70s design but I think it does an injustice to the designers of the time. They were creating new styles, forms and objects that didn’t look to the past, whereas retro - like in retrospect, retrospective - means looking backwards. It is a label we have imposed on their work, from our persepective decades later. Anyway, until someone comes up with something better I'm reluctantly obliged to use it. 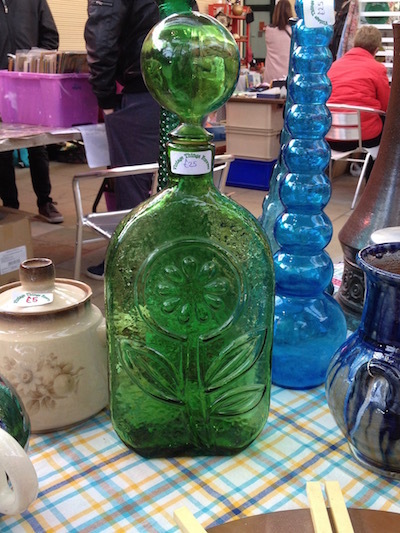 So here’s a very 'retro' item, a large lump of lumpy green glass with a stylised flower and oversized globe of a stopper. It has a naive quality, and it’s also a bit daft. I love it. Give me silver over gold, every time. 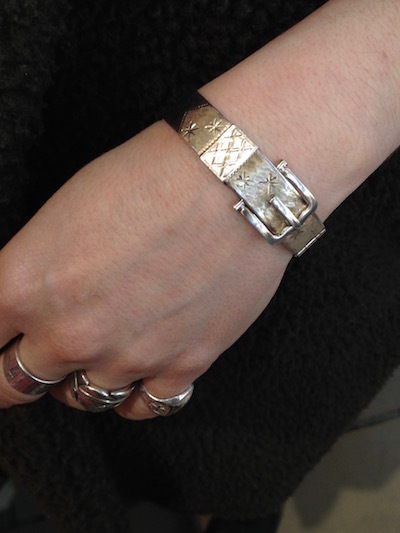 And if you want stylish vintage silver pieces, then silver specialist Gail of Mirabel has it covered. She picked out this belt-style bangle, which has a clever buckle fastening that really needs a video to demonstrate its cleverness, but you will have to do with this still photo I’m afraid. There’s the matt beaten finish, enlivened with engraved starbursts and polished buckle, that adds up to a lively contrast in textures, plus it’s a hefty piece of silver. A wearable and elegant investment piece. Despite being schooled in design history, I’m definitely no purist (as you can't fail to have noticed already). The ‘wood’ rendered in textured plastic defies the stern Modernist tenet of ‘truth to materials’ but at least the brand is AUTHENTIC in capital letters. 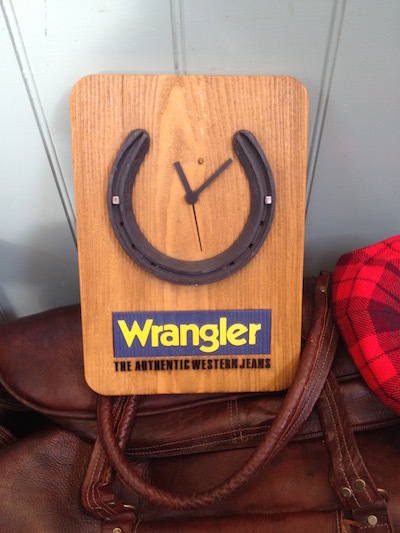 And it’s got a lucky horseshoe, chiming nicely with the Western image of the horse riding cowboy. David, proprietor of The Grand Collector, couldn’t guarantee that it will actually keep time, but at least it will bring you luck. Printed vinyl was all the rage in the late 1950s to early 1960s, and this example with its international selection of postcards including Florence, Venice, Zurich and New York evokes the glittering lifestyle of the jet setter. Or maybe just somebody who collects postcards. This jacket’s merits might not be immediately obvious to the casual observer. But it’s a lovely sand-coloured cloth with a longish nap, like an uncut corduroy, and it’s got the full complement of big practical pockets. In addition it appears to be fully lined with possibly an interlining too, so it should be warm. 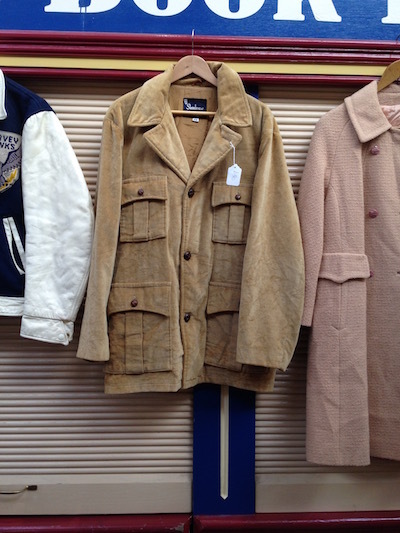 It’s an unusual hybrid - a safari-style jacket suitable for winter wear, with those nifty leather football-esque buttons too. We need lighter colours in winter, especially for the chaps who normally resort to black or navy. Not only does it counteract the general greyness of the season, but you’re less likely to be knocked over when you cross the road. 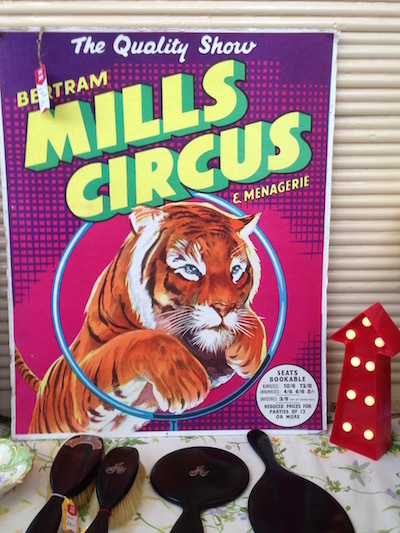 This dynamic poster of a tiger leaping through a hoop is tricky to date, but it’s definitely pre-decimalisation (1971). Not that I would ever endorse using endangered wild animals to perform demeaning tricks for our entertainment, but it’s a very arresting image. Just think of all the exciting ‘heated debates’ this could generate at your next dinner party!